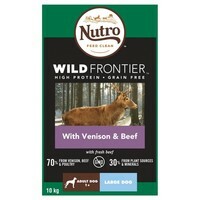 Nutro Wild Frontier Food for Large Adult Dogs is a complete and balanced grain-free recipe for large breed dogs weighing over 30kg, that imitates the diet their ancestors would have eaten in the wild. Developed to provide your dog with all the energy they need to play out their wild instincts, Nutro Wild Frontier has been made with only high-quality ingredients, which includes protein rich sources like Venison and Beef. Nutro Wild Frontier also contains a careful balance of carbohydrates to meet your dog’s essential needs and satisfy their natural cravings.